Great for groceries, laundry, books or whatever! Basket Size: 21"( H) x 14" (W) x 13" (D), Handle Height 37". The Winnie Wagon's ample size, lightweight design and easy operation make this Folding Shopping Cart our best seller of folding shopping carts. It’s design is sturdy yet the open-cell foam padded handle and large plastic casters allow the folding shopping cart to glide behind you with the greatest of ease. You’ll find yourself looking back just to see if the Winnie Wagon is still there… Whether transporting groceries from the local market or fresh laundry from the wash, with the folding shopping cart, you will enjoy whisking your goods to-and-fro for years to come. Although seldom needed, you will sleep soundly at night knowing you can, if called upon, tote goods up to 100 pounds in your folding shopping cart. The Winnie Wagon Folding Shopping Cart is available in two colors, red and black, many customers must have both. Choose one of each for a different mood. Sturdy, all-purpose cart makes it easy to transport groceries, laundry and personal items. Large plastic casters provide for a smooth transport over most surfaces. Sturdy. Lightweight. Well Constructed. Easy To Use. Easy Storage. Stores Easily. Supports Weight. Outdoors. Elderly. Long Distances. Anytime. This was purchased for my father's caregiver and she loves it! Holds lots of groceries for her trek to and from store. Lightweight. Easy To Use. Supports Weight. Safe. NOT A $52 CART. NOT EVEN A $20 CART. The product came in with a bent wheel post; it is flimsy and not worth $28 much less the $52 list price. You can purchase one this size anywhere for $23. Sturdy. Lightweight. Safe. Easy To Use. Easy Storage. Stores Easily. Supports Weight. Well Constructed. found wheels were hard to. found wheels were hard to. lost hook to keep it fold. Elderly. Anytime. bringing groceries in. Found instructions lacking. Not explained well. Needs better diagrams. Lightweight. Easy To Use. Stores Easily. Sturdy. RED. RED :-). The Allegro website stated 99-cent shipping. As we ordered within minutes of first accessing your website, the site changed it to your standard shipping fee. The very next day the website advertised that the 99-cent rate was being extended for 2 more days. We won't know until we receive our VISA statement whether we paid 99 cents for shipping or the standard fee. The product is fine, but we're not real happy with Allegro. In one place it says the casters are rubber, in another it says plastic. Which is correct? Rubber surrounds a plastic wheel. It is rubber that hits the pavement. 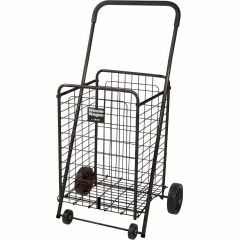 Is this cartsturdy enough to lean on while walking? What exactly is the cart made of? Is it metal? Metal covered with some other material? Need to know for a family member who can't be around soft plastics (such as what's on handles of some tools). Do the front wheels swivel or stationary? Can I buy the WHEEL AXCEL ONLY for the Winnie Wagon By Drive? Don't know had two different wheels fall off Need cotter pin, washer and, spring. Answered on Nov 27, 2012 1:45:33 PM by Shirl from Woodbridge. Va.
What is the assembly like. How good are the instructions. I haven't seen any complaints so far. I am seriously considering buying one. It is very easy to assemble and I hate assembling things I buy. I love this item. Easy to put together and easy to use! I purchased it for an elderly friend and it was well worth it.